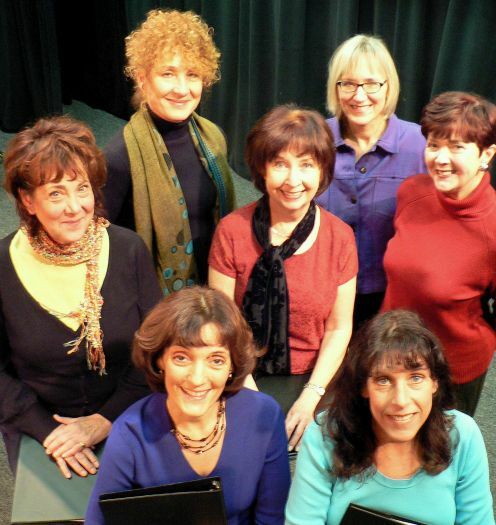 The “Momoirs” ensemble of writers and writer-performers: left to right, front row, Randye Kaye of Trumbull, Katie Marchand of Stratford, second row, Nadine Willig of Stratford , Jo Anne Parady of Norwalk , Rosemary Foley of Pelham , NY , back row, Linda Howard of Bridgeport and Sari Dodi of Westport . Missing from the photo: Elizabeth Keyser of Fairfield. Over the three years of its evolution, “Momoirs” has become a cathartic caldron of self-discovery for an ensemble of eight women. Half of them are writer-performers and half strictly writers. All are women of some theatrical accomplishment. Looking to the months ahead, the ensemble has booked appearances March 15 at a breakfast at Temple Rodeph Shalom in Bridgeport ( 2385 Park Ave.), May 2 at the First Congregational Church of Old Greenwich (108 Sound Beach Ave. ) as an evening benefit for the Stamford Counseling Center and two spring performances at the Manor Club in Pelham Manor , NY . Additional dates are being arranged. In the last two years, “Momoirs” has engaged audiences at Fairfield Theatre Company, off-Broadway at the Zipper Factory Theatre & Tavern and in libraries, at benefits and for community associations. Linda Howard’s creative intuition is the genesis of “Momoirs.” She is a resident of Bridgeport ’s Black Rock District, a writer and writing teacher in Trumbull . Her third novel, “Madame Bovary’s Daughter,” is to be published by Random House in 2010. “Momoirs” springs from the pages of a journal she started compiling when her daughter reached 16 and applied for a learner’s driving permit. The spiritual home—and rehearsal hall--of “Momoirs” is the Theatre Artists Workshop, a stage fraternity established in1983 by Keir Dullea of Westport who played the lead in Stanley Kubrick’s iconic “2001: A Space Odyssey” and a memorable list of roles in major films and stage dramas. The appeal of “Momoirs” radiates from its freshness, authenticity and energy. As material that largely transcends gender, men seem to identify with the essential truths of the characterizations. The cameos onstage explore visceral themes: a mother watching helplessly as a premature infant struggles for life, in a dream a daughter is visited by her dancing--and dead—mother, a hippie mother and a yuppie daughter squabble over a wedding dress and a mom connects with the generous soul of a mentally challenged son. Sari Bodi of Westport is one of the non-performing writers. Some of her vignettes are conveyed to the stage by Kathryn Marchand of Stratford , a versatile and accomplished actress in her own right and the daughter of the late Nancy Marchand who played Tony Soprano’s manipulative and vengeful mother on TV. Another writer is Rosemary Foley of Pelham , NY , the author of more than 70 plays. One of them, “”Oh, Promise Me,” was originally produced at the Theatre Artists Workshop in Norwalk and then adapted for the screen as a 30-minute com comedy premiered at the Big Apple Film Festival in Tribeca last November. Playright Elizabeth Keyser of Fairfield , one of the “Momoirs” eight and a former managing editor of the New Canaan News~Review, said the monologues written by Parady and Nadine Willig of Stratford give her “chills” because of their passion and intensity. A recent staging of “Momoirs” was directed by Cynthia Granville, an actress and former director/production manager of the Samuel French Off-off-Broadway Play Festival. As part of the production, Trumbull actress and vocal coach Randye Kaye recounted the compelling feelings stirred in an interaction with her son. So what’s ahead for “Momoirs” now?